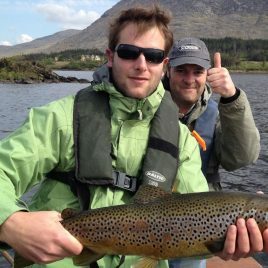 Lough Inagh Fishery is located in Connemara, County Galway and consists of fishing on Lough Inagh and Derryclare Lough as well as fishing on the outflowing rivers from both loughs. It holds spring salmon, grilse, sea trout and large brown trout. Lough Inagh and Derryclare Fishery consists of two Loughs, Derryclare and Inagh, lie in the lovely Inagh Valley with the Twelve Pins (Bens) of Connemara rising steeply to the west, and the Maumturk Mountain range to the east. There are two short connecting rivers, which contain four river beats. The fishery has spring salmon, grilse, sea trout and large indigenous brown trout. There are three sets of ‘Butts’ or long fishing piers, built out onto Derryclare Lough for the anglers convenience. There are no boats available on Derryclare Lough and all the fishing is done from the Butts and the bank. Lough Inagh Fishery is fly only, and normal fishing hours are 930am – 7pm. The river beats are rotated on a half day basis. The manicured river banks, and cosy fishing huts provide comfort for anglers of all ages and fitness. Lough Inagh has six boats and the fishing starts early in July and fishes. The west shore fishes best, also all along the islands and river mouths are the chosen drifts. Lough Inagh is the largest lake in Connemara, and outboards are essential. There are experienced boatmen/ghillees available for the lake and river beats, with prior booking from Lough Inagh Lodge Hotel.